Renovated from the original carriage house. This rustic 2-story loft-like guesthouse is detached from the main house and sits off a fully enclosed courtyard with gate. 3 blocks to dining, shopping, outdoor cafes, & Starbucks and Sunday farmer's market. 5 blocks from lake Eola park. And less than a mile to the courthouse, Publix, Fresh Market, and downtown Orlando. Walk or bike everywhere! It has an open kitchen to the great room and bedroom upstairs with full washer and dryer in the closet. Wood floors upstairs and concrete floors downstairs, stocked with fresh 800tc white linens and white towels. I am an Interior designer/ architect and I love to travel. I have lived in many great cities (NYC, Aspen, Miami, and LA) and I always come back here. I use VRBO wherever I go. It's the greatest way to really get to know how the locals live, find the best restaurants, and explore original walking communities. Orlando is a great city. I grew up here. Whenever I leave Orlando, I am reminded of the great weather and ease of living here. I can walk everywhere and there is always something interesting going on. Great local neighborhood vibe! Walk to dining, shopping, boutiques, and Sunday farmer's market. Enjoy the close proximity to Lake Eola, Downtown Orlando, Amway Center, Performing Arts Center & movie theaters. 30-45 minutes to the Beach, Disney Area & Theme Parks & Convention Center. Tub & shower, crisp white towels, MARBLE floor, Waterpic shower head with great water pressure. We installed and Instahot water heater that never runs out of hot water. Walking distance to dining, Starbucks, Publix grocery store, parks and Downtown Orlando. Historic tree-lined pedestrian sidewalks and brick streets. Great location and super comfy mattress! This was a very reasonably priced, wonderful location. It was centrally located to get to business locations all around the city. It's also central to restaurants, a lake, and amenities, so I didn't need a car once I finished work for the day. I have to say the mattress was so wonderfully comfortable, which I really appreciated. It was very comfortable and cute. I never saw or interacted with the owner, but had no issues, so I didn't need to contact her. The only problem was that there were two roaches in the kitchen area during a week long stay. One was dead, and the other was dying, and there were traps around, so I know the owner knows about the problem and seems to be trying to manage it. I also understand that it's Florida (I am from Louisiana so no stranger to roaches). But it really was disgusting and it seems like it's time to fumigate professionally. I am very clean and didn't leave any food or dishes out, so it's something I think needs addressed. I chose Margaret's place for my work trip to Orlando and I'm so glad that I did! The place is exactly how it looks in the pictures. It was so nice to be able to bring my dog and have a safe, comfortable place for both of us to stay. It's a very dog-friendly, lovely neighborhood within walking distance to parks and restaurants with outdoor seating. Not to mention Lake Eola, which is just a straight shot down the road and a beautiful place to walk around. Margaret allowed me to do my own thing while also making herself available for questions. No problems at all. Highly recommend! I spent a warm comfortable winter in this great carriage house. It is very cozy. I had everything I needed. The back patio was wonderful! I spent many afternoons and evenings sitting back there reading. There are many local little parks to walk around. I was able to choose between cooking and enjoying the many local restaurants. Margaret is always amazing about meeting any needs and answering questions. I highly recommend this house. A lovely and quiet neighborhood; walking/biking distance to lovely lakes and quaint restaurants. I had never experienced Orlando this way. The apartment is great for two people - in the end I was glad that a 3rd family member had not joined us (it would have been a tight fit as we are all tall people). The galley kitchen is modern and spacious. I had hoped to enjoy a long soak in a bathtub... but the stopper didn't work, so it required showering instead. Margaret was helpful trying to solve the problem; hopefully that can be resolved for future guests. 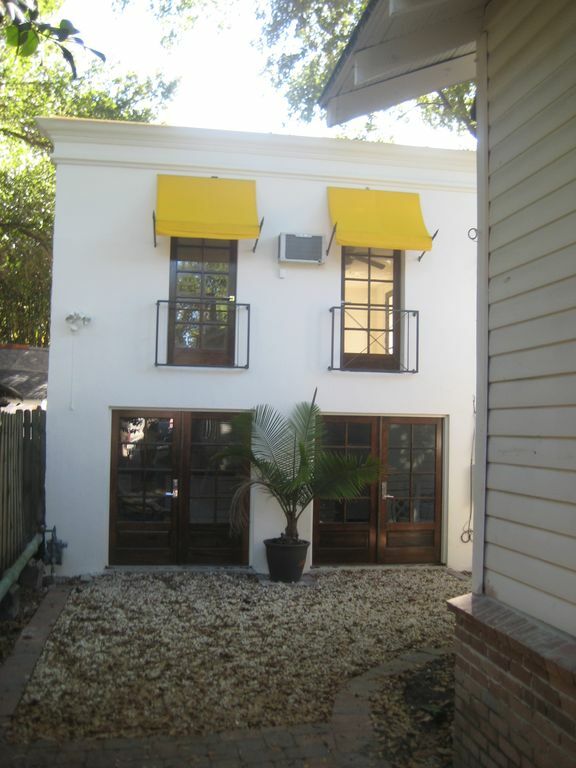 The property is cozy and very central if wanting to stay near downtown Orlando. The neighborhood is very nice and close to restaurants, cafes and shops. Also very close to Lake Eola where one can go for a walk or exercise. Super cute property! Loved the style and location! We stayed for four days and were out and about for most of the days but coming "home" at night was great. Full kitchen with new appliances and most of what you need was great. Bed and pillows were super comfortable and it was nice having access to laundry if we needed it. We really enjoyed staying here and look forward to staying again when we're in town! Margaret was attentive and very helpful! Great place to stay! Take the rickshaws/ uber to Amway Arena, Downtown.